A truly frightening outbreak of E. coli food poisoning appeared in Germany in May. Within a month it had infected more than 2,400 people in 13 countries across Europe, killing 23. Authorities then pointed the finger at beansprouts, delighting food scrooges because everyone knows that beansprouts are hippie food. And in fact — ooh this is too good to be true — they were “locally grown” organic sprouts from a farm in Lower Saxony. There was much gloating from the food right wing (e.g., Washington Times: “Dead Bodies Demand Organic Food Moratorium“). Then ugly reality set in: tests on the sprouts were actually inconclusive, and the beans used in the sprouts weren’t even “local” — they were from southern Europe and Asia and were likely shipped via Hamburg and Rotterdam. They decided it wasn’t the sprouts, and the hippies and locavores were off the hook (and the Washington Times printed a retraction…not). So the trail has grown cold. Or has it? There was a fascinating piece called “Phage on the Rampage” in Nature News, the journalistic arm of the journal Nature. It first points out that the real question is how the infectious bacteria get into the food chain in the first place. No final specific answer on that yet but we do know some important general things. 1. What’s killing people is the result of natural genetic modification. The toxin in O104:H4 isn’t an E. coli toxin; it’s a shiga toxin, produced by a shiga gene inserted into the E. coli by a bacteriophage virus. The modified E. coli has its own acronym: STEC for Stiga Toxin producing E Coli (to be mentally filed with MRSA for Methicillin-resistant Staphylococcus aureus). 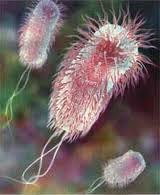 Ugly little E. coli. But the ugly effects of strain O104:H4 aren't really its fault; it has been naturally genetically modified. Actually, Shiga starts out in a bacterium. I remember reading about shigellosis — bacterial dysentery — when we were getting ready to do ethnography in rural Nigeria. (We never got it, but we got just about everything else.) It seems the bacteriophage picked up the Shiga toxin genes from Shigella bacteria, and now is putting them into E. coli and other bacteria (here’s more on this, for the technically inclined). Isn’t that something. Bacteriophage viruses are doing what genetic engineers do: cut genes out of various species, stick them into E. coli, which then pumps out the compound the genes encode. Numerous commercial products are produced this way (like recombinant Bovine Growth Hormone, and the chymosin in much of our cheese). 2. 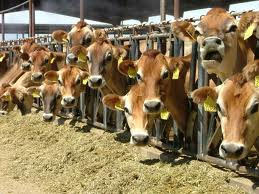 Circumstantial evidence now points to factory farms, not hippie farmers. The most likely source of the STEC, says Nature News, is ruminant animals, whose guts have high levels of bacteriophages. And this particular STEC has the unusual characteristic of resistance to multiple classes of antibiotics, so the bacteria are probably coming from where there is plenty of selective pressure to resist multiple antibiotics. No word yet on how this STEC made its way from CAFO’s (factory farms) into the food chain, but that’s probably where the germ originated. So this STEC is the result of “natural” genetic modification only in the sense that the genes are being inserted by bacteriophages, not by Monsanto whitecoats. But the evidence suggests that these particular killer genes were moved into this bacterium because of conditions we set up in CAFO’s. And it’s not the hippies you need to need to worry about, it’s probably the CAFO’s. This entry was posted in Agriculture, Biotechnology, Food, Industrial Agriculture and tagged agriculture, biotechnology, factory farming, food safety, genetically modified, organic, toxicology. Bookmark the permalink. Sprouts are a food safety problem whether they are produced industrially or organically. Producing sprouts from locally grown seeds would make it easier to track down contaminations but that’s not going to happen — you can’t get locally grown alfalfa, mung beans, etc. everywhere. You are 100% right to stress where the germs came from in the first place, whatever vegetables or whatever they ended up on. Factory farms are looking more and more guilty.